They say that France is frenchest along its longest river. The world famous historical monuments in the Loire Valley (including over 600 castles) are found in a surprisingly unspoiled wooded landscape. Inside the castles it is easy to imagine the bawdy Renaissance festivals that were once held by their royal owners. The most important castles are in Chambord, Azayle-Rideau, Chenonceau, Blois and Amboise. The old town of Bourges featuring St. Stephan's Cathedral and the Hôtel Jacques-Coeur is worth a detour, as is the Château de Chinon. The Loire Valley is known as the “Garden of France”. The Sologne contains over 1.2 million acres of lakes and woodlands. The Brenne National Park to the south is inhabited by many threatened species of plants and animals. The town of Amboise nestles in the shadow of a castle of the same name from the 15./16th Century. The residence of the Valois, like many others, was confiscated by the Crown. Afterwares Louis XI. and his son Charles VIII restored the castle magnificently. When Frances conquered Naples and Milan, many Italian architects and artists emigrated to France. Among them was Leonardo da Vinci, who lived in Amboise until his death in 1519. In the castle today is a museum with armor, furniture and tapestries. The view of the river is worth a visit. 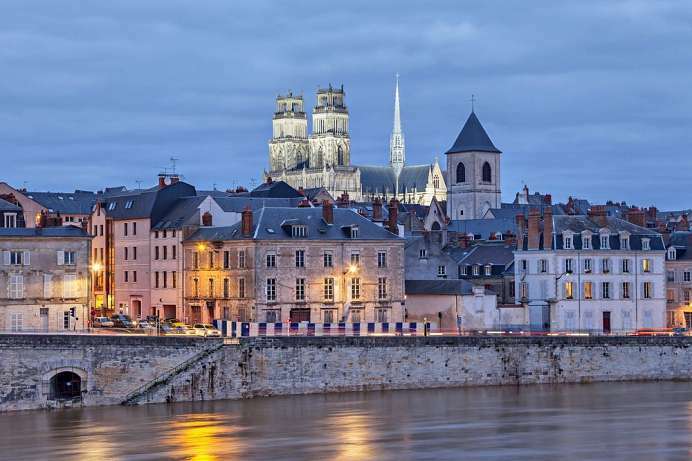 The city on the north bank of the Loire has a historic entre with winding streets and picturesque squares. It is dominated by the mighty cathedral and the magnificent Château Royal de Blois. 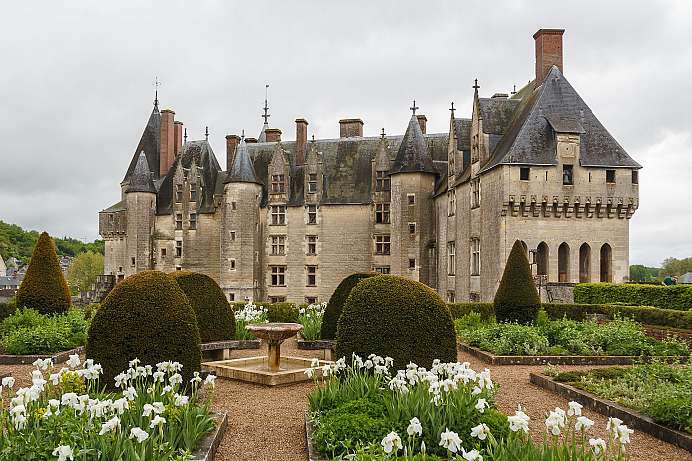 It was from 1498 to 1589 the main residence of the French kings, who made numerous extensions and alterations. 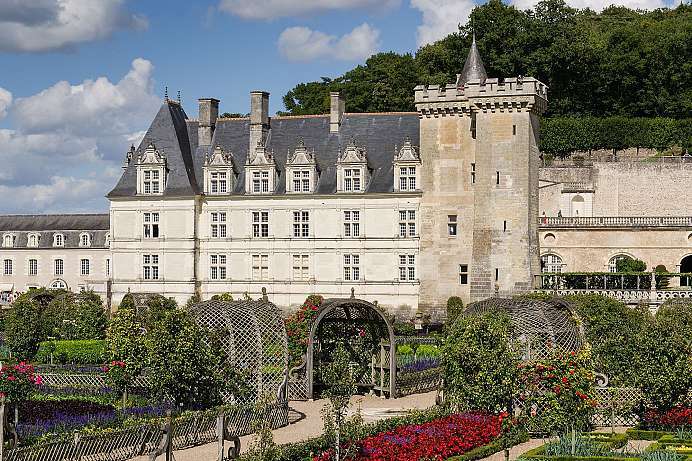 After the French Revolution, it was the first Loire castle to be restored. Since then it has been used as a museum. The castle near Chinon was restored at the end of the 20th century for ten years with the aim to restore the medieval fabric. Today it looks like a fortress with drained moat, drawbridge, machicolations and loopholes. The interior is accessed from the courtyard via a spiral staircase. The large hall is laid out with Touraine flints. The windows of the west facade were enlarged already in the Renaissance. Around the castle, there are 14 gardens with fairy-tale themes, including the Magic Forest, the Path of Tom Thumb or Alice in Wonderland. 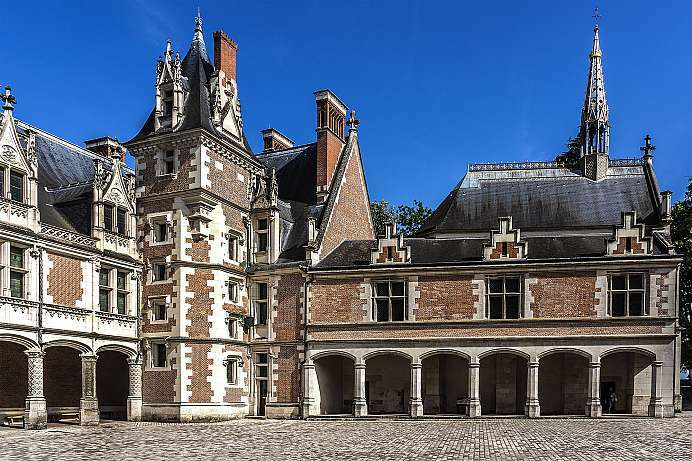 The origins of this château go back to a late medieval castle belonging to the knight Ridel d'Azay. A later French king, Charles VII, razed the castle in the early 15th century. 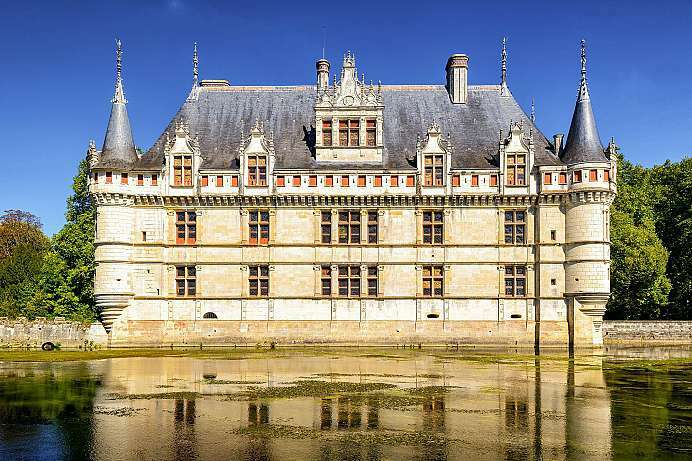 About another century later, the royal treasurer, Gilles Berthelot, built the current château between 1518 and 1527 on an island in the Indre river. Unfortunately, he was not able to enjoy his charming estate for long. He was caught embezzling funds and had to flee; his elegant residence became property of the king. This château in Beuvrontal was built by a French secretary of state in the 16th century. It later underwent some major modifications. Most of the palace was torn down in the 19th century and replaced with a large park, which is a registered French historical site. The Galerie des Illustres is especially worth a visit. Here you can see 327 portraits of important figures from French history. 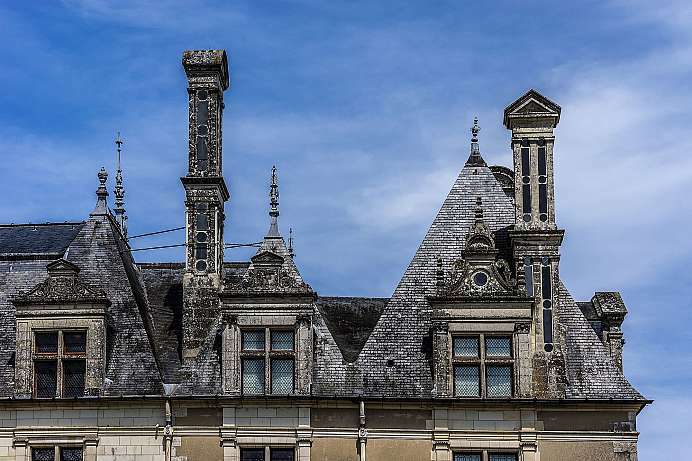 The largest and most magnificent château in the Loire region is located on an vast former hunting area. It was built during the first half of the 16th century by King Francis I as an ostentatious hunting château. The building measures 117 x 156 meters and contains 426 rooms as well as over 300 fireplaces. Leonardo da Vinci spent several years at Chambord during its construction and contributed to its design. More than 1,800 workers helped build it. The palace park covers 55 square kilometers and can best be explored by bike. 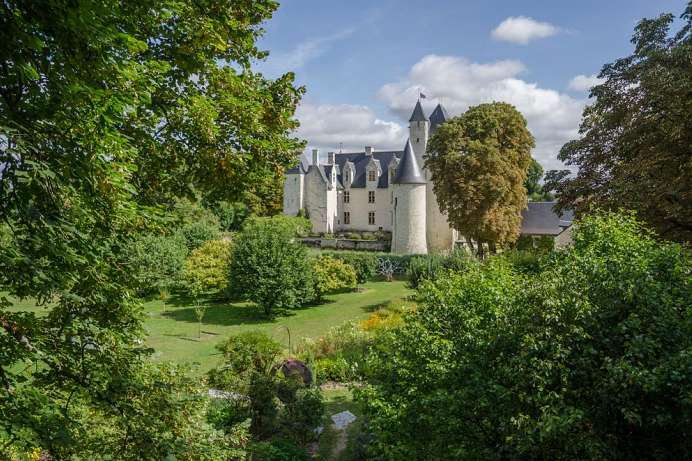 This splendid castle rises over the right bank of the Loire in the middle of the city of Langeais. In the Middle Ages, an earlier castle once stood here, which the English razed during the Hundred Years War. The only thing they left standing was the “donjon,” which means"keep." Château Langeais was rebuilt in 1465, and twenty-five years later, it was the site of the Renaissance wedding of Charles VIII and Anne de Bretagne. Today, the castle impresses visitors with its imposing round towers and restored drawbridge. Fifteen rooms have been furnished with original furniture from the 15th and 16th centuries. The Château de Villandry is the youngest of the châteaus in the Loire Valley, which may be the reason why its gardens surpass all the others. At any rate, most visitors come on account of the gardens, which were restored during the 19th century and are unparalleled in Europe. There are flower beds for themes such as love, water and music. There are also artistically arranged vegetable and herbal gardens and a labyrinth. The colors and motifs of the various garden beds are variegated and imaginative. Combined with the architecture of the château, they form a magnificent ensemble. The small Loir (not to be confused with the Loire) is a northern tributary to the better known Loire. North of Angers the river flows into the Sarthe. Before that, it winds leisurely through graceful vineyards such as Coteaux du Loir, Jasnières and Coteaux du Vendômois. There are many things to discover along its shores: stately homes, ancient chapels with frescoes and sleepy villages that only come to life when farmers' markets are held. One of them is Lavardin. 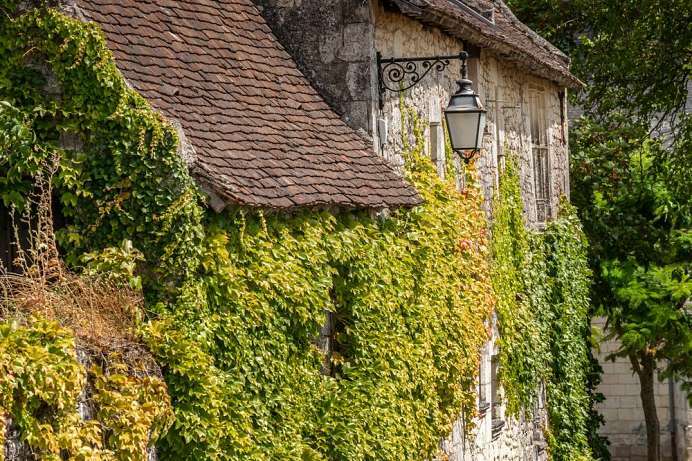 With its medieval townscape, a castle ruin and the early Romanesque church, it is considered one of the plus beaux villages de France (the most beautiful villages in France). 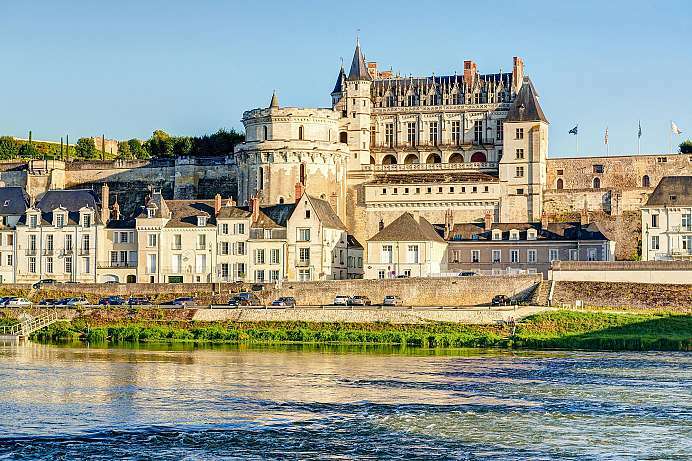 Where the Loire reaches its most northerly point, lies the university city of Orléans, which was France's last stronghold in the Hundred Years' War against England. On 8 May 1429, after months of siege, the city was finally freed – by an army, which was led by a 17-year-old girl named Joan of Arc. Because of this feat, she became France's great heroine which unfortunately did not save her from being burned two years later at the stake. The Duke of Luxembourg had taken her prisoner and handed her over to the Duke of Burgundy who in turn sold her for 10,000 francs to the British. Center of the old town is the Place du Martroi, on which there has been an equestrian statue of Joan of Arc since 1855. 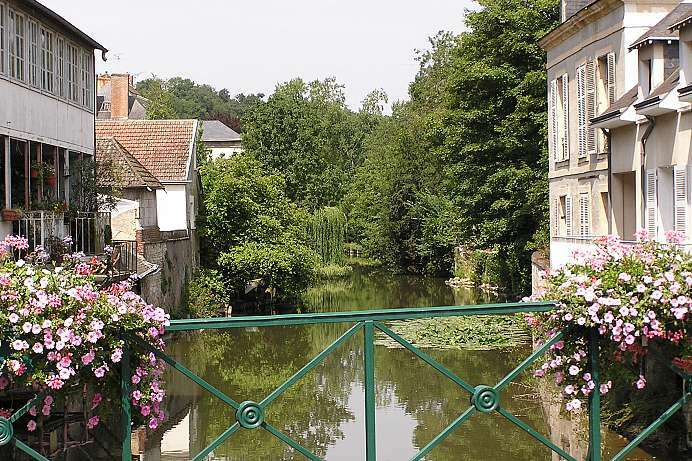 The historic town is idyllically situated off the beaten track on a northern tributary of the Loire. The old town, surrounding the Church of la Trinité, is crisscrossed by narrow canals. Two relics, a tear of Christ and an arm of St. George, gave it wealth and importance as a pilgrimage station on the St. Jakobs-Way during the Middle Ages. Panoramic views of the French picture book landscape open up from the castle ruins. Many castles, wine cellars and old mills hide in the Loir Valley. 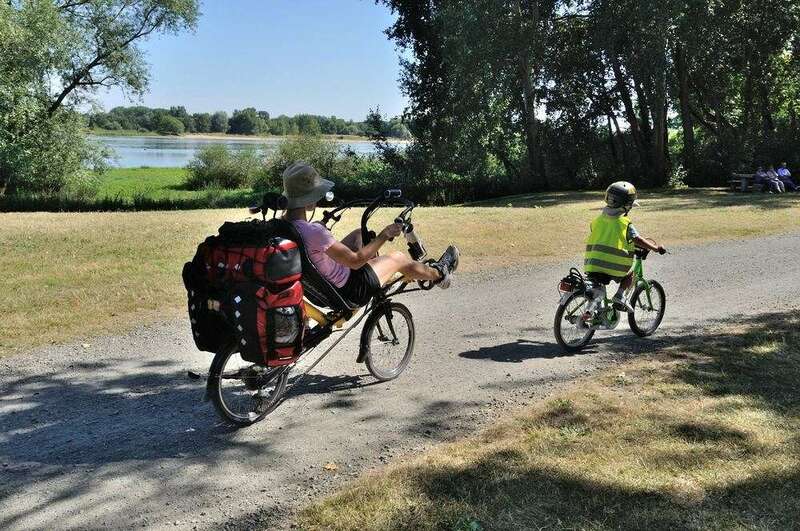 Bike paths follow the river banks, which are the best way to explore the valley.